This 81,715 sq. 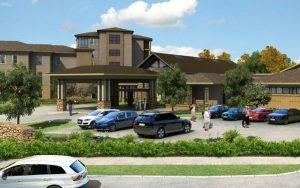 ft. expansion on the Lenoir Woods campus includes the addition of a commons building, an assisted living and memory care building, a long-term care facility, and the REACH short-term care facility. The 22,360 sq. ft. commons building includes a new finishing kitchen, new secondary kitchen for high volume, administrative offices, a centralized security station, a clinic with exam rooms, an art studio with a kiln room, a market area and dining room, an aerobics and fitness center, a natatorium with locker rooms, a salon, and a physical/occupational therapy area. This final phase of construction allows residents, staff, and visitors to walk the entire 11-building campus without having to go outside.